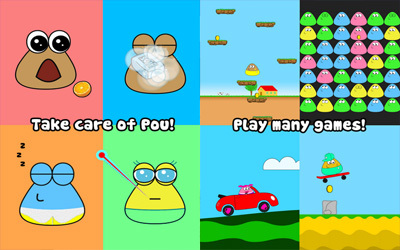 Pou APK 1.4.72 becomes one of the cutest games in android device. Have you ever played this game? If you have never play it, this article will explain all about Pou. In this game, you will have alien pet called Pou which act like human baby. This creature is triangular, rounded, and has brown skin color. You have to feed it, play with it, clean it, and witness its growth. It is simply like you have your own baby, but it is alien. As the levels up, the backgrounds and outfits will be unblocked to gratify your feeling. There are many features you can get from having Pou. First, you will take care and feed of Pou and witness it growth. The sign of hunger and dirt will be shown on Pou performance, so you can do following act. The second is, you are allowed to play game inside the game room to collect coins. The coins will be very useful to buy many items to support Pou life and appearance. For the next, you will be a scientist who does some experiment in the lab using potions. This feature is one of the most astonishing parts you should try. Fourth, you will take a control of Pou performance in which you are capable of customizing the outfits, eyeglasses, hats, and many more. If you are boring enough with the game wallpaper, you are allowed to change it based on your taste. This game also allows to lay in group, so you can invite your friends to play Pou together. Internet connection might be needed to use this feature. The last but not least, Pou can talk to you and you can do the same. You need to speak certain word; Pou will hear your word carefully and then repeat it to you. Try Pou for Android right now and grow your own alien pet.